Here's to the anonymous pioneer at Revlon responsible for a black-and-white-speckled top coat called Rebel Graffiti. 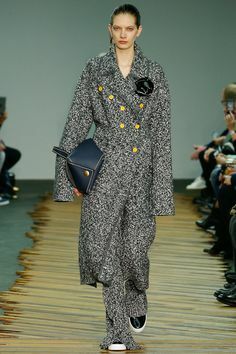 The composition notebook of a lacquer hit drugstores in February, just days before Proenza Schouler’s Jack McCollough and Lazaro Hernandez sent out Fall 2014’s cropped turtlenecks and round-shouldered dusters in a nearly identical pattern, one which also adorned Phoebe Philo’s ground-pooling pants and '30s-era double-breasted coats for Céline. The common thread? The 'Bacterio' pattern created by the 1980s Italian design group Memphis. Indeed, the Milan-based collective, once beloved by the fashion elite (Karl Lagerfeld outfitted his entire Monte Carlo penthouse with Memphis designs during his early days at Chanel) is having something of a resurgence. Founding members Ettore Sottsass and Shiro Kuramata’s pieces were highlights of Tuesday’s Barry Friedman: The Eclectic Eye auction at Christie’s, and Nathalie Du Pasquier just launched a graphic collaboration with American Apparel, where black-and-white Bacterio abounds. So, until you can get your hands on that Proenza coat , try painting them up in Revlon's $4.99 version of the everywhere print. Photos [1, 2] by Deja Turner.